Victory Grace Center in Washington DC. We designed, set-up, and configured an audio system that needed to be portable. The church is meeting at a large school auditorium, which results in setup and teardown every Sunday. 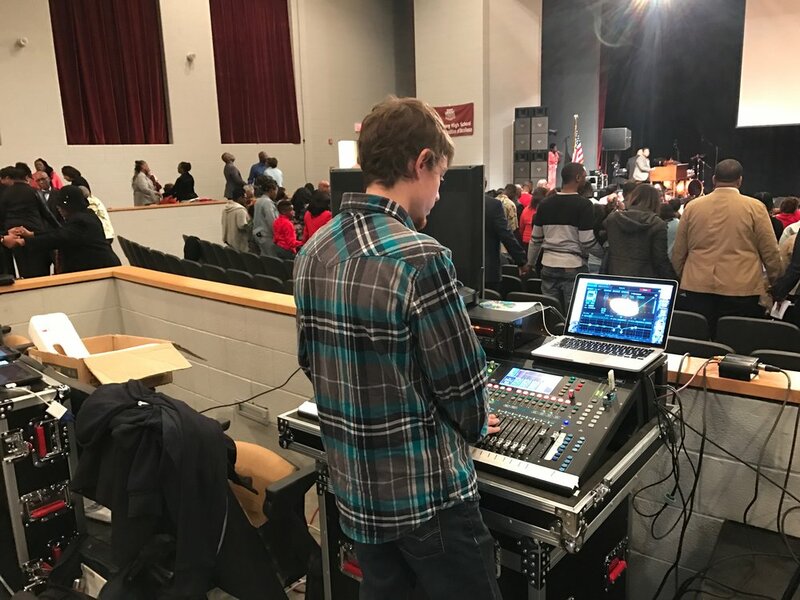 The church needed an easy system to set up , but powerful enough to handle the demands of high SPL praise and worship music in the 1200 seat auditorium. Even levels throughout the auditorium even with stage speaker set up. Worx Audio including, 2-X2 main speakers and 4-ULT 18" subwoofers show the reduced size compared to the schools older speaker system beside them. Road cases were provided for every part of the system for easy load in and teardown each week. Josh setting up the Allen & Heath QU32 digital console.